Happy Valentine’s Day! Instead of bringing you more chocolate and sugar to celebrate the day of love, I’m bringing you a recipe that is healthy for you, helping to insure you’re around to experience many more Valentine’s Days to come. 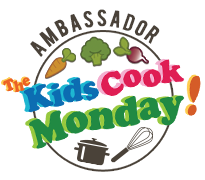 I have teamed up with the American Egg Board (AEB) for a special “Build a better Breakfast with Eggs” SideCar series event on Kitchen Play. The catalyst of this event is the release of a new study by the United States Department of Agriculture (USDA), that confirms that eggs are significantly lower in cholesterol than previously thought—a whopping 14 percent lower! According to the results of the new USDA study, the average amount of cholesterol in one large egg is 185 mg, 14 percent lower than previously recorded. The study also showed that a single large egg now contains 41 IU of Vitamin D, which is an incredible 64 percent increase from the last time this same testing was done on eggs in 2002. Because eggs are one of the few foods that are a natural source of Vitamin D (which plays an important role in calcium absorption, helping to form and maintain strong bones), this increase is an important and exciting one. Finally, the study showed that the amount of protein in one large egg (6 grams, which is 12% of the Recommended Daily Value) has remained the same. Dietary guidance recommends limiting cholesterol consumption to 300 milligrams per day. The lower level of cholesterol in conjunction with the significant increase in Vitamin D, and the protein content in eggs, makes them a smart way for families to start their days, providing them with a healthy energy source, especially when paired with other healthy breakfast choices. So what better way to celebrate this study than on the day of love? In light of this exciting new information, the AEB asked the participants in the SideCar event to come up with a delicious recipe with eggs to serve at breakfast. I know how hard it is to get a healthy breakfast on the table in the midst of a hectic morning, and complicated time-consuming recipes just aren’t an option! 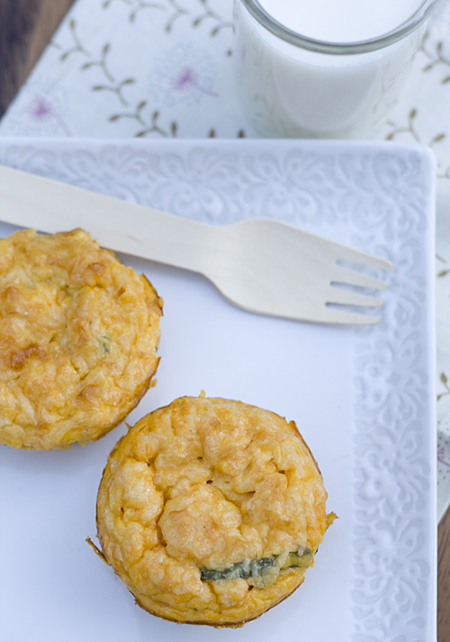 So I came up with a recipe for Sweet Potato Quiche Cups—healthy, easy to make, and best of all, they can be made ahead of time! The sweet potato can be cooked and mashed ahead of time. Making the actual quiche batter takes about 5 minutes of time, and then the quiche cups spend 22 minutes in the oven and then they’re done! Once cooked, they can either be served right away, or stored in the refrigerator or freezer to be served later. These quiche cups are light, moist, and flavorful. The sweet potato adds a touch of sweetness and lots of flavor, plus a beautiful golden color, and a sprinkling of grated Parmesan cheese over the tops gives them a nice nutty crust. 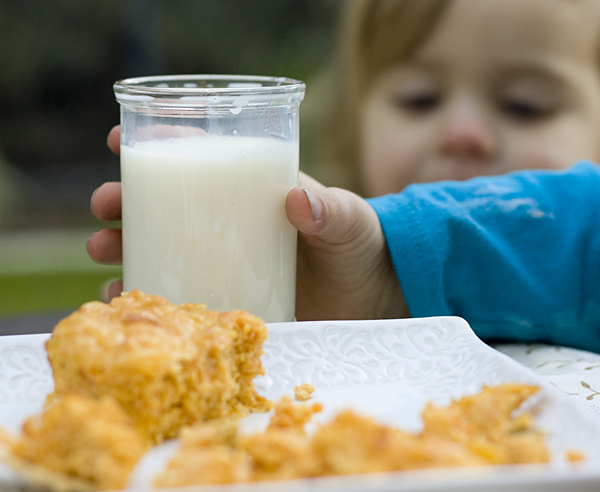 I personally loved them, but the real test was the first time I fed them to my girls. From the way they each devoured their cups, I knew right away that we had a winner. 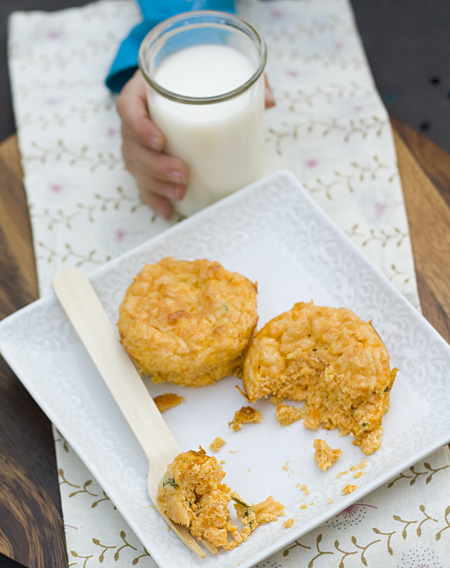 Not only will these quiche cups go over well with your kids, but you will love them just as much! Don’t forget, although the health and nutrition of our children is important, it’s important that we take care of ourselves too, not only for our own health, but so that we are setting an example of healthy living for our children. Make sure you check the information after the recipe to find out how you can win a year’s supply of eggs from the American Egg Board! 1. In a large pot of water, simmer the sweet potato with its skin on until it is soft. Drain and discard the water. Peel the sweet potato and then mash it with a fork or potato masher. Set aside to cool, or refrigerate until ready to use. 2. Preheat the oven to 375 degrees Fahrenheit. Generously coat a 12-cup muffin pan with nonstick cooking spray and set aside. 3. Whisk together the cooled mashed sweet potato, ricotta cheese, salt, and nutmeg. When incorporated, whisk in the beaten eggs, then stir in the basil. 4. 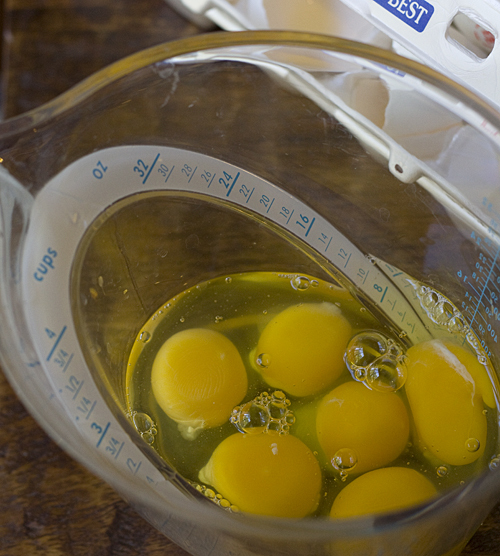 Using a 1/4-cup measuring cup, pour the egg mixture into each of the muffin cups. Sprinkle the grated Parmesan cheese on top of each quiche cup. 5. Bake until golden brown, about 22 minutes. Let cool for 10 minutes, then carefully run a paring knife around the rim of each muffin cup. Carefully lift each quiche out of its cup. 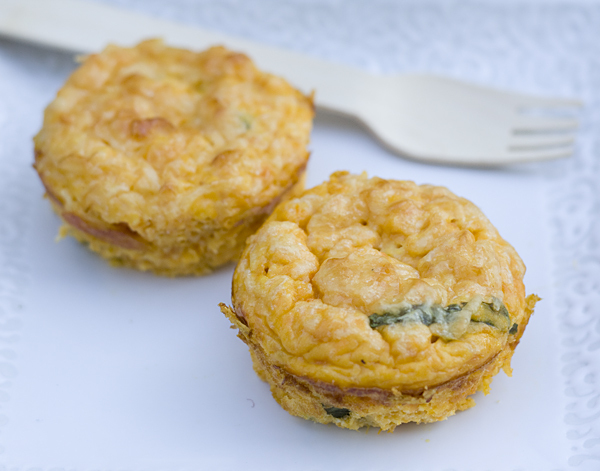 * Quiche cups can be made an refrigerated for up to 3 days. 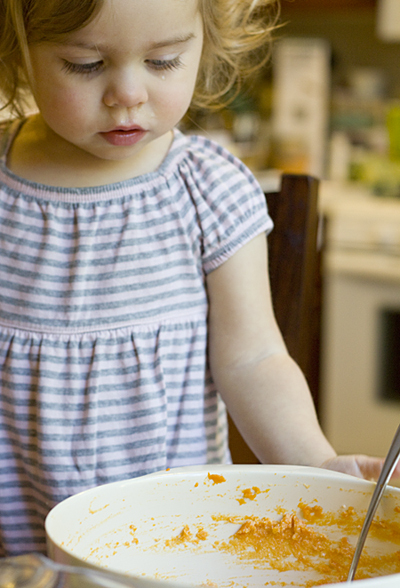 When ready to eat, reheat briefly in the microwave. * Quiche cups freeze very well. After cooking, let them cool, then freeze them in a single layer in an airtight container. The frozen quiches should be eaten within 3 months. Reheat the quiches on a cookie sheet in a 400 degree Fahrenheit oven for about 15 – 18 minutes. Win a year’s supply of eggs! 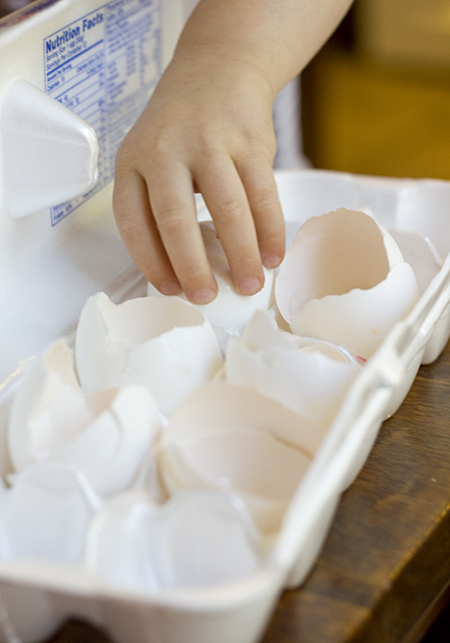 The AEB is giving away 6 prizes of a year’s supply of eggs to readers of KP and LFM! To enter for your chance to win, you can either write a post which includes your favorite breakfast recipe that uses eggs, and/or write a post discussing the new study. This is an exciting opportunity for you to get involved in food journalism by spreading the news! For the complete rules on how to enter, go to Kitchen PLAY. * For more information on cholesterol and the nutritional benefits of eggs, along with egg recipes and cooking tips, visit www.incredibleegg.org. * Disclosure: I’m writing this post and creating this recipe as part of a partnership between Kitchen Play and The American Egg Board. They have compensated me for my time and cooking expenses but my opinions and tastes are my own. I love this post, not only for your delicious recipe, but for encouraging all of us (moms especially) to take care of ourselves. It’s so easy to forget as we focus on everyone else in our lives. Your recipe can help us do both, as you’ve shown by example. We can share time with our kids preparing the dish, while at the same time ensuring a healthy start to the day for everyone. Thanks for your inspiration in promoting the incredible egg! I am going to make these — they fit right into my food plan. I just have one question: What is a “large” sweet potato? 6 oz.? One cup mashed? Please enlighten. Thanks for your great Web site. @Robin Tanis, Hi Robin, So glad you commented asking this question! That information was in my notes, but somehow didn’t make it into the post! I have added the information to the recipe. A sweet potato in the ballpark of 16 ounces is what I use. I have been wanting to make a crustless quiche lately, and these little babies sound awesome! The best part (besides the nutrition)? These can be made ahead! I think my favorite egg breakfast has to be a Mexican omelet: whipped eggs cooked with corn tortilla strips, peppers, olives, and salsa, then covered in cheese and broiled to melt the cheese, then topped with lettuce, guacamole, fresh tomatoes, and sour cream. Yum. I love quiche and sweet potatoes and if it’s possible to prepare them in advance, that’s even better! I can’t wait to try these! I have a whole bunch of sweet potatoes that need to be used, I think I’ll make these for brunch! Thanks for sharing. This is a great breakfast option. I love quiche, so these are right up my ally! Yum!! I love everything about these! So cute! Wonderful breakfast (or snack), Rachael! Since we are very regular egg eaters, I was excited to hear the news about the greater health benefits. These sound so good (and healthy!). I love the last picture with your daughter – so precious! Ahh, this is awesome! Eggs are my FAVORITE food, I have one/egg whites every morning for breakfast. Spray/grease a glass pyrex dish and pre-heat the oven for about 375 degrees. Blanche the broccoli, and while doing so, beat the eggs until consistent, then mix in the milk. Pour into the glass dish. Once broccoli is finished, cut it up into small pieces and sprinkle throughout the dish. Add any milk or eggs to desired point. If using Canadian Bacon, sprinkle it into the pan as well and sprinkle cheese on at this point. Place dish in the oven until puffy and golden brown. Funny how the proffessional advice changes so often. It’s best just to use common sense and moderation when it comes to food. We’ve been making these ‘eggie muffins’ in our house for a long time. I chop up veggies and put them in little cups and let my 4 and 5 year old create their own eggie muffins. I really love this idea! Sweet potatoes are so versatile, and I’m sure they make these mini quiches absolutely delicious. I can’t wait to make them :). Yes please! What a great breakfast! oh i definitely want to try this! 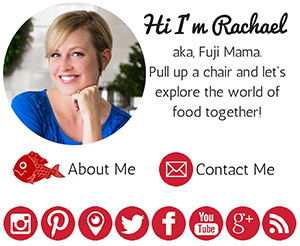 These sound awesome Rachael! I love the addition of sweet potatoes! And the photos of the kiddos are adorable! Cake batter pancakes?! You are evil! Pure evil! This looks so good! I have been looking for a quiche recipe. Thanks! Looks like a wonderful breakfast food. I love to see those cute little hands and faces in the photos. The quiche looks good too. Loved the photo in the LA Times of Squirrel! I am in the middle of making these lovely quiches and I don’t see when the Parmesan adds in to the process. Is it sprinkled on the tops after the baking? @Dafna, Hi Dafna, Thanks for catching that for me! 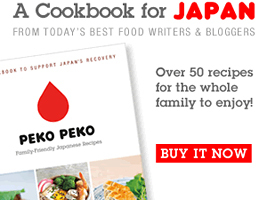 Somehow the recipe got a bit switched around in the publishing process! The cheese is sprinkled on top of the quiche cups right before you put them in the oven. Sorry about the confusion! I made these for my husband and myself this morning! I made tons of mashed sweet potatoes last night so this morning coming across this recipe was exactly what I needed to use up the last of our sweet potatoes. It was so good and moist. Love quiche in general and the combo of egg and sweet potato is just devine. Think I could make this in pie crust instead of individually portioned? what is the role of the protein in eggs when making a quiche? or Eggs have functional ingredients that play an important role in the success of a range of products. Explain the role of the protein in eggs when used to make a quiche. Name and describe the process that takes place in your answer. So I can finish my resit SAC for my food tech study. Thank you so much!